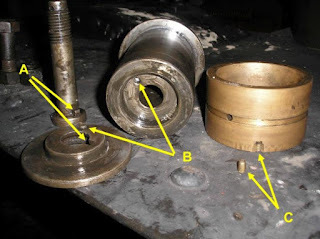 ... although we had high hopes of disconnecting that second rod; allowing it to drop, and then removing the front one … all the best laid plans … !!! X marks the spot where the trouble began. 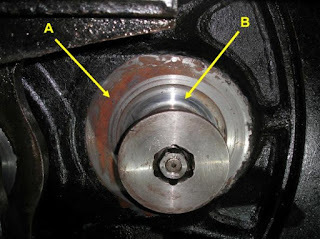 When attempting to undo the nut, the whole pin rotated. There is supposed to be a locking pin at the back that prevents it from rotating. Something was amiss! Despite some valiant attempts at clamping the thing to stop it from turning, no luck. As it is at the back, there was little we could do. It meant removing the second coupling rod ... and the third … and the fourth! All of the others behaved impeccably. 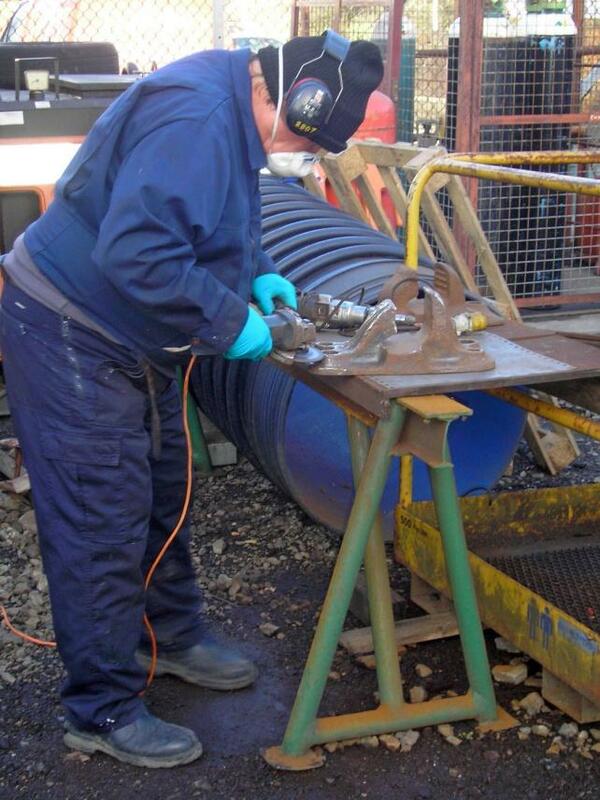 But in order to stop the errant one from turning, David had to weld a bar onto its backside. Then it could be held and the nut could be turned on its thread. 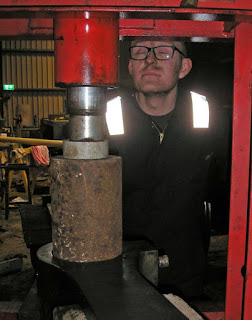 Then, of course, David had to grind off the weld to make good the back. The method of securing these things is quite an art. The grub screw C is supposed to prevent the bush from turning. A small projection B is supposed to fit into a hole and thereby lock the back ring against the main pin. Finally, a lug A on the bolt slots into the back plate to prevent the bolt from turning. Which failed in our case? B did not do its job. 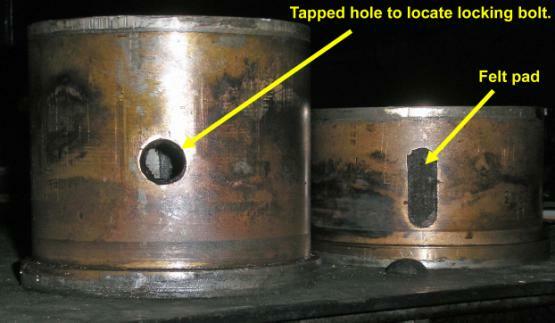 In fact, I think its diameter was too large for it to fit into its hole! It did look the worse for wear, so I drilled it out. Bruce said that he can make a new one that fits. So, pretty much all day there was Gil, Bruce, David, John T and I heaving rods around. John T’s first job was as Apprentice Measurer. 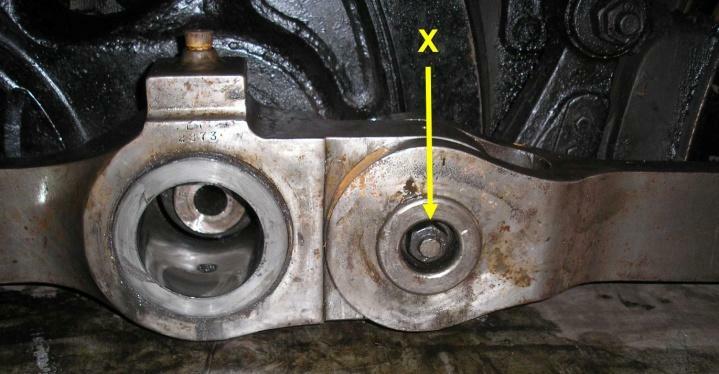 He was recording all of the dimensions for manufacturing new bushes … apart from the one that was too large for his measuring stick. John G was involved at times, mainly as gopher. 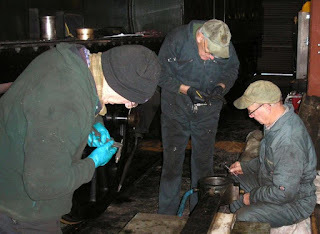 But while nobody was looking, he removed the vacuum gauge from within the cab, as all three gauges are to be calibrated on Friday. During the week, there was an order for a Midland Railway boot scraper, so I did the needle-gunning first thing, and then John G finished it off by wire-brushing and then blacking its bottom. Having got all of the equipment out, I decided to do an LNWR chair as well. At the end of the day, I just had time to paint the lettering on an LMS chair that is also ordered. Once the rods were (all) off, we could see another problem. 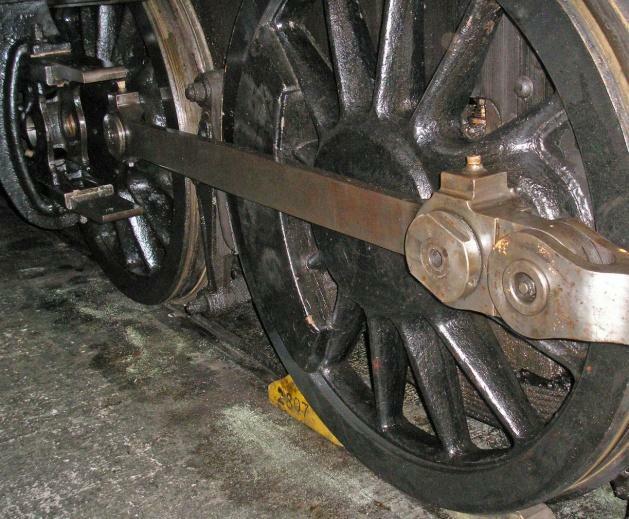 The front coupling rod has been rubbing against the wheel boss. 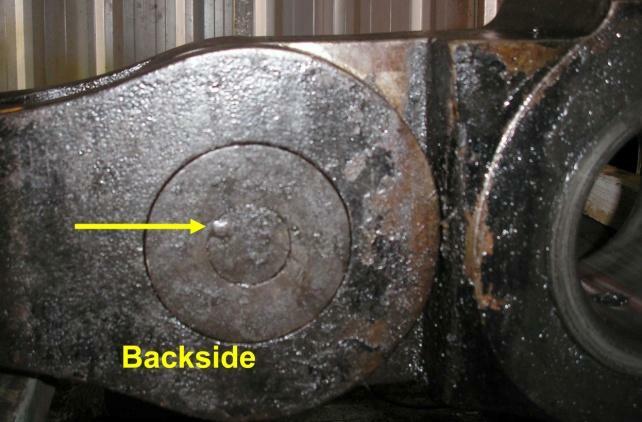 There is an outer wear pattern (A) that also shows signs of rust on the leading section. Then there is a recess (B) in the wheel boss. 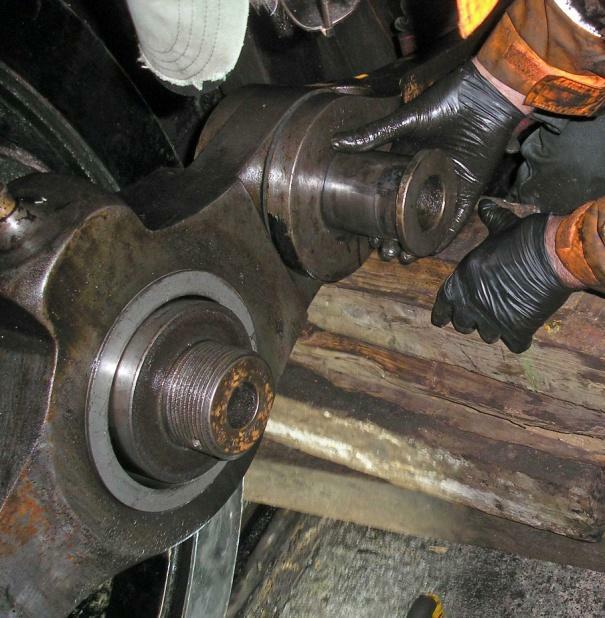 This has not been worn away by the rod; it must have been there right from when we first fitted the rods. We need to seek advice about this - what is it for and what do we do about it? Much measuring in the shed. John, Gil and David are all applying their measuring sticks to almost everything. Necessary, of course, for getting the new bushes made to the correct sizes. Bruce was doing his measuring behind the camera. Gil sought advice, and we now know what to do about the machined recess in the wheel boss. No idea why it is there, though. 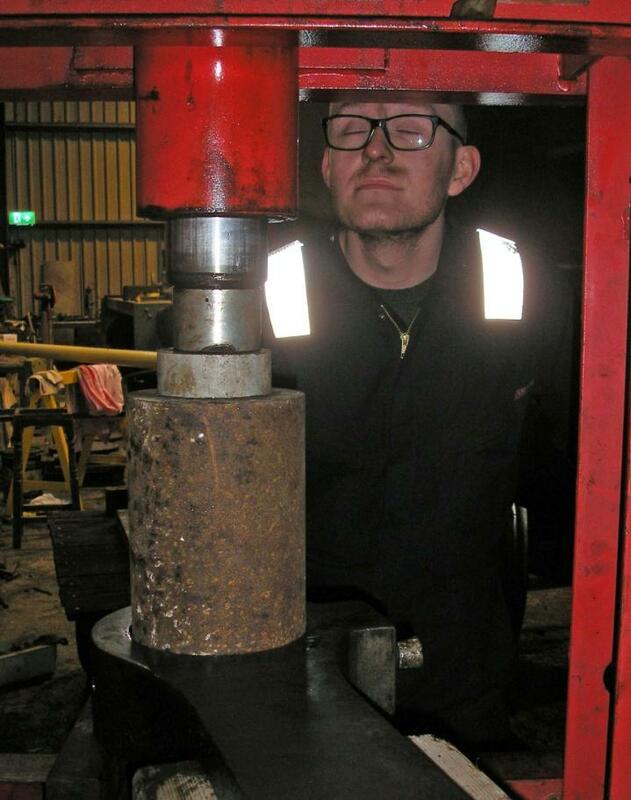 Ah the sweet smell of hydraulic fluid! It took a while to find suitable lumps of metal to fit the bush diameter. It was a squeeze getting the trolley down between Dinmore’s tender and the side of the shed. However, once we’d positioned everything, pushing the bush out went like a dream. Then we had to turn the rod around to press out the other bush … but not enough room to turn, jammed as we were twixt tender and wall. So, we decided to move the tender along and make more room. 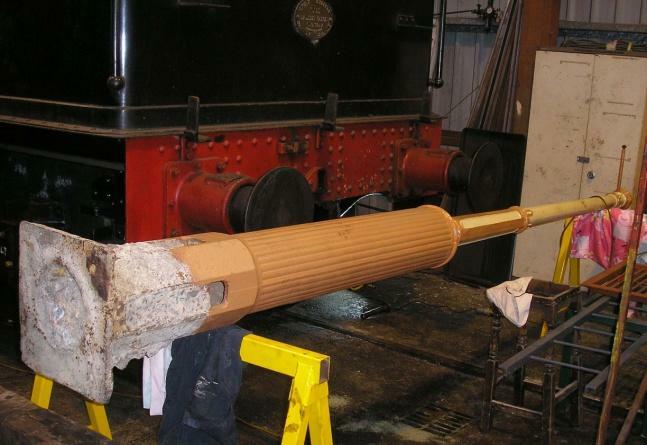 Behind the tender was a beautiful lamp post under restoration. This had to move first! 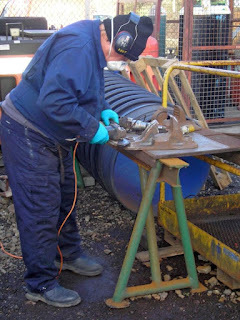 It was all hands to the post, as it was rather heavy - especially at the end that was full of concrete! We managed to move it along, and in doing so freed up a trolley. Rob and I put our backs into getting the tender rolling (after finding out that putting your back up against 2807’s buffer beam was a tad painful due to the overhang of the front running board). Someone was manning a pinch-bar, too. When Bruce yelled out to stop, we pointed out that Rob & I had no brakes!